“I don’t know if there is a next step because ticket prices are an issue in England. That may foreclose further expansion. We’ll have to see,” Henry told AP at Yankee Stadium, cited in the Echo. 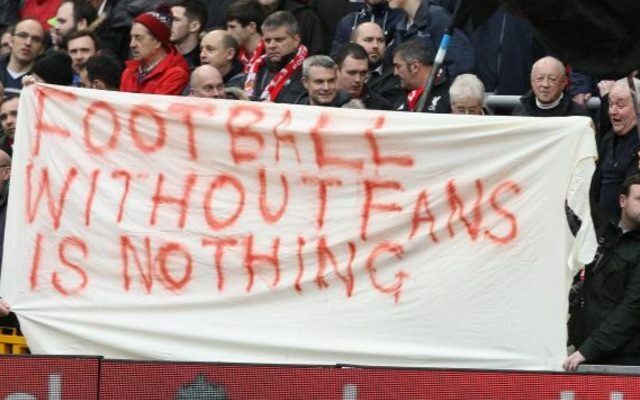 Last term, Liverpool fans protested FSG’s initial decision to charge £77 tickets in the New Main Stand, by streaming out of the ground after 77 minutes and waving black flags at the ground. It worked and FSG apologised, before lowering the ticket prices. Even with the cheaper tickets, FSG are still expected to recoup the £120m they spent on the expansion within five years – due to future naming rights and increased match-day income. But Henry’s comments suggest that because they won’t be able to charge through the roof in the expanded Anfield Road End either, there’s little financial incentive for them to get the ball rolling. There were plans to get Anfield up to around 60,000 capacity from 54,000, but it doesn’t look like happening anytime soon. Henry should be careful, too. His comments indicate that he only lowered the ticket prices because he had to, not because he realised it was the right thing to do.